Last time, I found a box of jigsaw puzzles at Dollar Tree and decided to turn it into a project. Putting all the pieces together was a lot of fun. Zo (that's how I'm going to call my daughter in all my posts) was very patient and didn't rest until the whole picture was done. We taped the pieces into a cardboard and then again taped the whole thing around to make sure none of the pieces can fall out. - we discover one new state per day, learning about where are family and friends live. - we "travel" from state to state by a little toy car, trace a path with a finger or jump over states with a small plastic kitty. 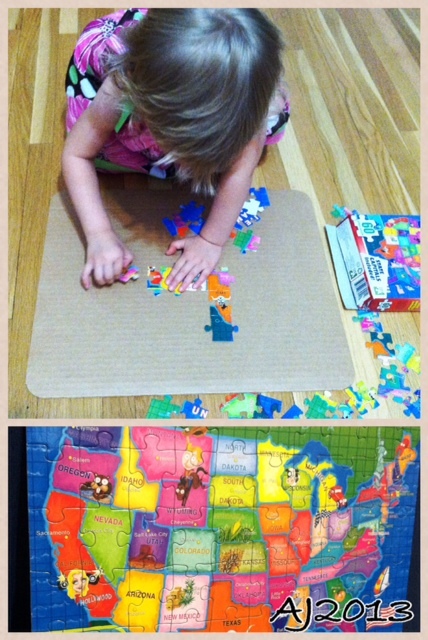 - the U.S. map has it's own place at Zo's room. I am planning to eventually put it on the wall but right now it has to be available any time she wants it. You can make jigsaw puzzles out of calendars, magazines, postcards, etc. Your students can cut an illustration into a given (age appropriate) number of pieces (practice counting!) and put it back together. You can glue the puzzles into a cardboard and you can even frame such a composition (remember, a frame is only $1 at dollar stores). What is your family experience with jigsaw puzzles? Have you made any teaching materials you'd like to share on this blog?